Home / bead simple / sunset! hooray! 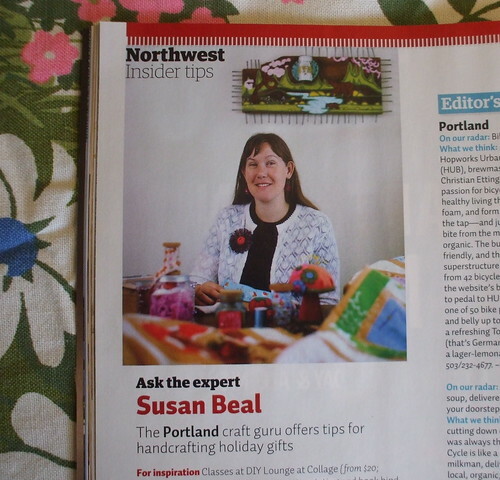 I am a huge fan of Sunset magazine (not to mention their indispensible Western Garden Book) and I am so excited that Ivy Manning thought of me for her crafty holiday gifts feature in the new issue! I have subscribed forever, and it was downright thrilling when it arrived this week and there I was on page 30. A huge thank-you to Ivy, Sunset, and their fantastic photographer, John Clark. John was kind enough to include some of my favorite things in the photo with me and my hot pink Solo Earrings: our prized Justin “Scrappers” Morrison painting, my modern heirloom quilt, and my Cathy of California flower brooch and pincushion. The interview is in the Northwest edition of the December issue, and it’s also posted on their site. I really like the way it looks in print (I share the page with Hopworks Brewery and Soupcycle, both right here in my neighborhood!) so I put a photo up on flickr so you and my mom can see the whole thing, too. 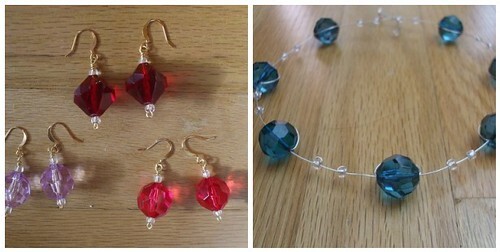 I got to talk about some of my favorite local-and-everywhere resources for holiday crafting ideas, including DIY Lounge, Cool Cottons, Crafty Wonderland, and CRAFT: magazine, and Ivy spotlighted my own video tutorials for making the Solo Earrings and Vintagesque Necklace from Bead Simple, too. 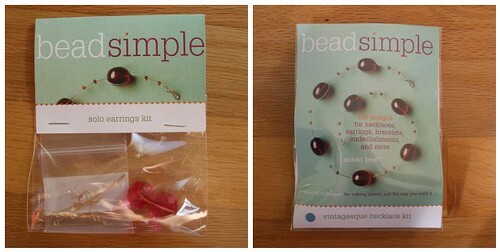 So in honor of the article, I have finally added new Bead Simple earrings and necklaces kits to my Etsy shop! They come with vintage beads, findings, and complete written and illustrated instructions — everything you need but a set of pliers. There are lots more details over at beadsimple.com and in the kit listings, but I’ll just add that to celebrate the kits seeing the light of day after all these months, I am offering free shipping on any kit, plus a free Solo Earrings kit if you order a signed copy of my book, through next Tuesday, 12/2. It’s been a bit of a rough fall, and it’s nice to have something cool out in the world! Thanks to the folks who have already mentioned that they saw and liked the article — you have made my week. secret societies and sales earrings + necklaces for holiday gifts – thank you, Sunset! Congratulations! That photo of you is so cute! I love that photo of you! Congrats! That is so neat! Sunset is one of my favorites too, and it’s wonderful that they included you. yay! congratulations! that piece looks fantastic, and it is such a great magazine. your kits are lovely too. That is great! Congrats! I just love that blue necklace. Did Ivy tell you? We went to culinary school together. I was just sitting in the dentist office flipping through the Sunset magazine and you popped out!! I think I said out loud, It’s Susan! Very cool. Hope you are great.